Shri Narendra Singh Tomar has taken over as new Union Minister of Labour and Employment here in Shram Shakti Bhawan New Delhi today. 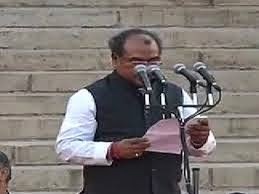 Shri Tomar is a Lok Sabha member (BJP) from Gwalior Constituency of Madhya Pradesh. Speaking on the occasion Shri Tomar said he will soon have a meeting with Senior Officers in the ministry to chalk out the 100 day road map for action as stipulated by the Prime Minister. He said emphasis will be on imparting skill development with avenues of Employment.